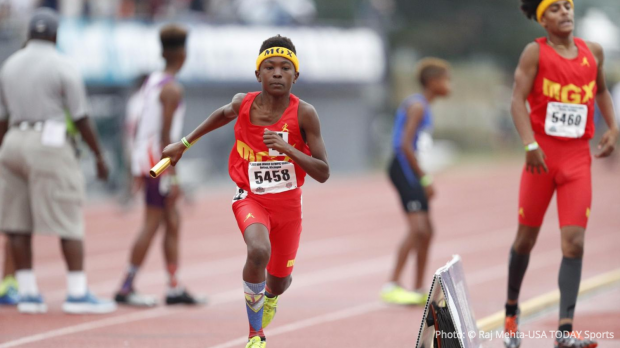 The Miami Gardens Xpress 12-year-old boys 4x800m relay won in 9:24.6, just five seconds outside of their own AAU National Championships record of 9:19.92, set one year ago. Check out the finish line shot in the tweet below and watch the full race video on FloTrack. The Track Minnesota Elite women's 17-18 4x800m relay overtook hometown favorites and early leaders Motor City TC on the third leg and held on for the win, 9:23.39 to 9:35.61, to defend their AAU national title in convincing fashion. Their coach couldn't contain his excitement and photo bombed their post-race interview! 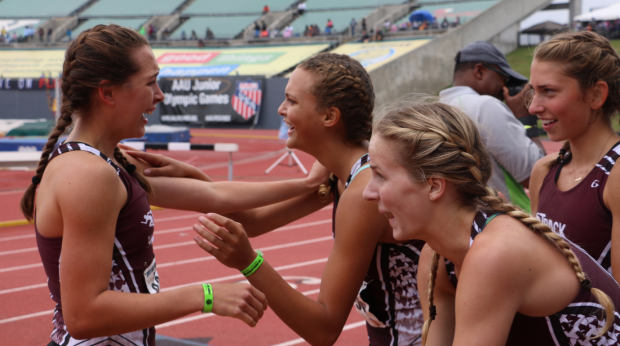 Track Minnesota Elite congratulates their anchor leg after she put a 10-second gap on early leaders Motor City TC to defend their AAU national title in the women's 17-18 4x800m relay. Photo by Johanna Gretschel.